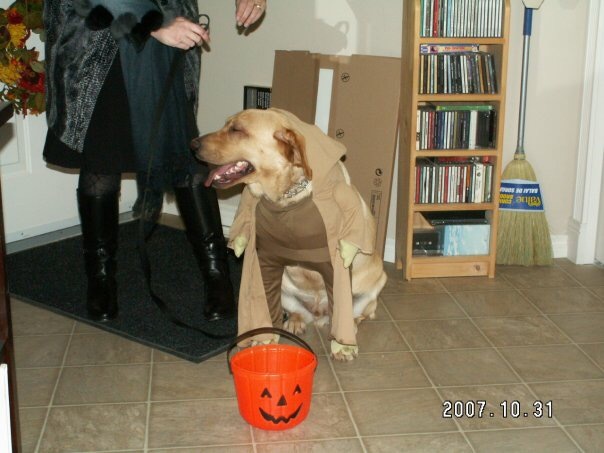 If you want to send in a photo of your pet dressed as a fictional character, you can send it to theaspbooks@gmail.com You have until midnight Monday. We’ll be posting all the entries, and the winner for best entry will receive a signed copy of Gayleen Froese’s new book What The Cat Dragged In, plus something special. Gayleen will be shooting the photos for the 50 Shades of Spenny contest on Saturday. As we sold 7 copies of the book within the contest time frame we will be posting 7 photos over the next week. We have a contest attached to this as well. Send us photos of your dog dressed as a fictional character of your choice. The winner receives an autographed copy of What The Cat Dragged In, our latest novel from The ASP, and a little something extra. The deadline was today at midnight, and we have received a few entries, but, in light of the announcement last week being on a long weekend and such, I’ve decided to extend the deadline to Monday at midnight, so you have all weekend to take those photos and send them in to theaspbooks@gmail.com. 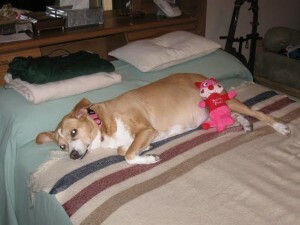 Our first entry today, sent by Fred Bradbury, is his dog Lucy in tempting and flirty deshabille as Mata Hairy. I mean really, though, you’re here. You should buy everything we sell…then ask for branded merchandise. The ASP was happy to spend Friday night at a fundraiser for the Vegreville Centennial Library. The library staff did a great job of organizing the event, gussying up the facility, and bringing out a large crowd. Gayleen read from her books, followed by a lively Q and A session. After that we mingled for a while, sold a great many books, and got into some excellent conversations about writing and the state of the publishing industry. Gayleen then performed a few songs, and we headed out onto a rather terrifying highway and then home. You never know what you’re wandering into when you sign on for a reading. This was one of those great nights when you have an interested crowd, and the time to really get to know them. Thanks again to the staff at the VCL, and to everyone who came out. We had a great time. We were able to get some footage of Gayleen reading and performing as well. Enjoy! Our Gayleen Froese was invited to read and perform her music at a library fundraiser at the Vegreville Public Library tonight at 7 p.m. Gayleen loves libraries and would never say no to a fundraiser for one of them. We’re going to be there as well, selling her books and CDs and supporting her in general. We’d like to invite you to come out and see her. She’s an amazing live reader and musician, and we can pretty much guarantee a good time. The What The Cat Dragged In contest is now in effect and sales to folks who mention they saw our posts, or who know us totally count toward the contest. If you want to support independent publishing and music, this is a great, fun chance. If you want to see Laird Ryan States in a TIE, this is also a great fun chance. As many of you know The ASP has released Gayleen’s book, What The Cat Dragged In, as our second release. The contest that we had for Silver Bullets was kind of fun, so we thought we’d try something similar but different. The contest is two-fold. 1) On this coming Friday, February 13 from Noon MST to Mindnight MST, for every copy sold as a paperback on Lulu, or as an ebook on Kindle, Gayleen and Spenser will pose separately or together for iconic scenes from books or movies. We’re calling it 50 Shades of Spenser. Is that dirty? The pictures won’t be. 2) And this the fun part. From this Friday to Friday February 20, 2014 you can send your pictures of your pet dressed as a private detective, or your favourite fictional characters. Gayleen and Spenser will pick a winner, and that winner will receive an autographed copy of the book plus a special something extra. We’ll post all the pictures as we get them. Please send them to us here. I will, of course remind you Friday when the sales contest is about to start. Let’s have some fun with this one, and share this one. Gayleen’s book is, I think going to be a lot of fun for wider audiences, and this is a fun contest. Also, on Friday, Gayleen has a reading at the Vegreville Public Library @ 7pm. She be reading a few parts from her books, playing some tunes and chatting with people. It’s a library fundraiser, and Gayleen will do darned near anything to help libraries, as she reckons they’re one of the things society did right. So if you’re free, and up for the drive, we’d be happy to see you there. 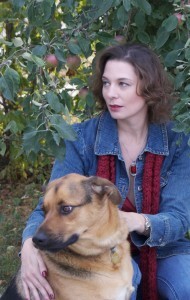 The ASP: What The Cat Dragged In is narrated by Spenser, who is a dog. That can be really twee, but that absolutely isn’t the case here. What was your approach, and how do you think you dodged that bullet? Gayleen Froese: I decided to make this a proper noir mystery. The humour comes from the fact that this straight-faced book, with all the betrayal and moral slippage of noir, is about a bunch of animals and peanut butter sandwiches. There’s no need to get cute beyond that. The ASP: What or who was your inspiration to write this book? Gayleen Froese: A few people had recommended to me that I write about my pets. I didn’t want to do a Marley and Me kind of book. I wasn’t sure people would want to read a book about my dogs when they could instead be playing with their own dogs. But the idea of taking something of my pets’ personalities and relationships and building a genre story around that sounded fun. The ASP: Spenser is, of course, your actual dog. How much of your actual dog made it to the page. 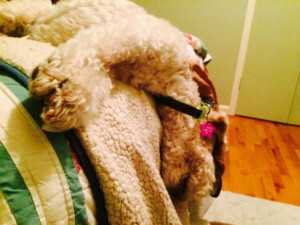 Gayleen Froese: Spenser is part of everything in my life, because shepherds shed like crazy and, once you own one, you can’t have an experience that doesn’t include their hair. In terms of whether his personality made it to the book, I think it did. This is a dog who walks me to and from the garage when it’s dark and watches me like a lifeguard when I’m swimming. When new people come to our house, he escorts them to and from the washroom to make sure they behave while they’re upstairs. He assumes a lot of responsibility for keeping his world in order. Also, he’s much too friendly with the neighbour’s cat. The ASP: This book shortlisted in the 2010 3-Day Novel Contest. Did you enjoy that experience? Gayleen Froese: It’s a good challenge in the sense that it teaches you things about your strengths and weaknesses as a writer and you have a legitimate sense of accomplishment when you’re done. More than anything, I think being forced to put around 30,000 words to paper in three days makes you get out of your own way. You don’t have time to question the very idea of writing or revise the same paragraph a hundred times. That said, one of the harder lessons in my life has been that I there’s only so far I can push myself. It’s exhausting to focus on a puzzle as difficult as a novel(la) for three straight days. If you don’t believe me, try it. To be honest, I do think anyone who’s interested in writing should try it at least once. But I have done it, so, these days, I save that energy for whatever novel I’m working on. The ASP: Where do you get your ideas? Just kidding. Who would you say is the writer that had the most influence on you, and why? Gayleen Froese: I think detective fiction in general has influenced me because it goes after who we are, who we want to be and how people live… but it doesn’t crawl into its own navel. There’s dialogue and character and plot and motion instead of endless rumination or three page descriptions of a violet on a stone. Because I grew up reading Rex Stout and Dashiell Hammett and Ross Macdonald and Robert B. Parker, I knew big questions could be tackled in the middle of a good story… so that became what I wanted to do. The Asp is pleased to announce the release of our second title, released today in paperback from The ASP here. It can also be purchased as an ebook here, here, or at any of Amazon’s international affiliates. 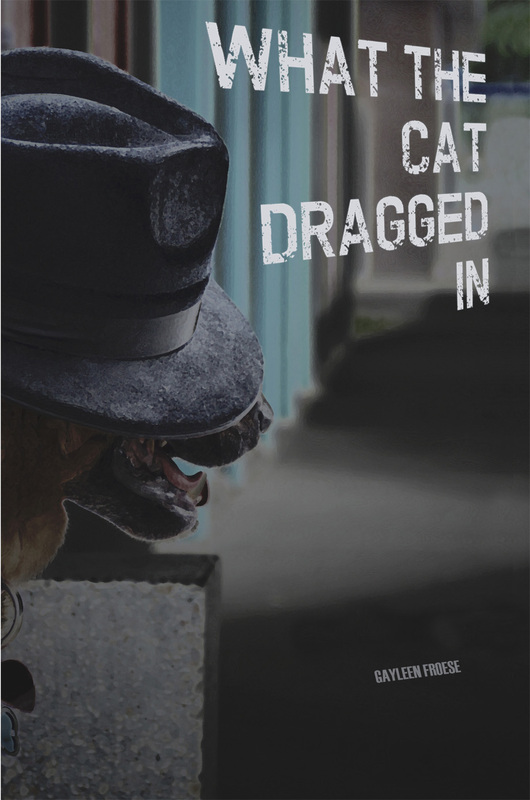 What the Cat Dragged In by Gayleen Froese is a children’s book written in such a way that it has just as much to offer adults. Spenser T. Dog is a German Shepherd with a 100 pound imagination and time on his paws. From his office in the dining room, next to the place the balls roll under, Spenser sniffs out a case that involves a peanut butter sandwich heist and a feline femme fatale. His papillon secretary and scruffy informant next door help him in his eternal quest to prove that, in a morally complicated world, he really is a good dog. Look forward to an interview with Gayleen in the near future to discuss Spenser, and his adventure. The ASP’s first release is Silver Bullets, currently available for purchase online in both paperback and ebook. We sat down with the Laird for a short interview about the book, and its release. The ASP: Mormons and Quakers have prominent roles in Silver Bullets. Did you use this book to explore religion in the American Old West? Laird Ryan: Not deliberately, but a few people have mentioned that they saw a strong element of that in the book. I was looking for a background for Harry that was as far from his eventual destiny as I could find, and Quaker seemed to fit. I’m not what you’d call a fan of religion, but as far as they go, I find that particular belief system to be kind and decent. The ideals of a religion and how it gets practiced vary, though. I’m sure there are Quaker creeps out there. As for the Mormons, well, I’m not sure the Mormons in my book are Mormons at all. In fact, I’m pretty sure they aren’t. I can’t say more without spoilers. I couldn’t invent a religion any stranger that 19th century Mormonism if I tried, though, and I’m a little fascinated by them. I’m particularly interested in the journey from where they came from to what they’ve become in the modern era. And that’s a whole thing I’m not getting into. At all. The ASP: What appeals to you about the West, or the Weird West, as a setting? Laird Ryan: Until I wrote this book, honestly, it hadn’t. Harry came to me as a character living in modern times. When I first envisioned him, he was living in the present, but was born and raised in the old west, and it was a huge part of who he was. I wanted to discover his past, and this book was a big part of that.It’s grown on me. I did a fair amount of reading on the time periods, and the little details of frontier life began to engage me. My dad is, and always was, a huge fan of Westerns, and I’v become more of one myself as a result of looking how to find this story. I feel closer to him as a result. Which, of course, I’ve not told him. For we are men. Maybe he’ll read this. The weird element particularly came first, as it almost always does for me. I’m pretty much the opposite of a “realistic fiction” writer. 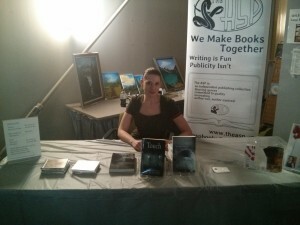 The ASP: Why did you choose to self-publish? Laird Ryan: Is desperation a good answer? I don’t want to disparage the publishing industry. It’s full of people doing their best in a new information economy. I wanted to try it, to see if I liked it, and to see if I could get a readership. I’d love to make money at it, but that’s secondary to wanting to engage with popular culture. I write because I want readers. This is a way to do that. Would I say no to a traditional publishing deal? Not immediately. I’d have to consider saying yes very carefully too. They aren’t the path to success they used to be either, or so it seems to me. The ASP: This novel began as a short-listed entry in the International 3 Day Novel Contest. What is it like to write a novella in three days? How did you approach expanding the book to novel length? Laird Ryan: Writing a novella in three days is sometimes an amazing experience, and other time it rips the guts out of you. There is no margin for getting stuck on a plot point. I didn’t so much expand it for publication as make a decision to keep it as a novella. I set the background for Harry, show his first major supernatural exploit, set up a sequel and get out. I decided to make it like a nouveau pulp. It’s written quickly, novella in length, and designed to be serialized. I’d planned to novelize it, but soon realized I wanted to take more time, meander over the course of several books to tell this story right up to the present and, in fact, beyond. The ASP: Some characters in your novel are known fictional or historical figures. What guidelines did you have for yourself in writing about real people or characters from other works? Laird Ryan: Don’t get sued. I have an ongoing thing in my work, which tends to take place in a single shared world, of replacing historical figures with their fictional creations for fun. When those creations are not in the public domain, I cheat. Happily, Judge Holden, who many will be familiar with from Cormac McCarthy’s Blood Meridian, also was a genuine, and completely insane historical figure. as well. The Asp: If you were to meet your protagonist, Harry Parker, how do you think you would get along? 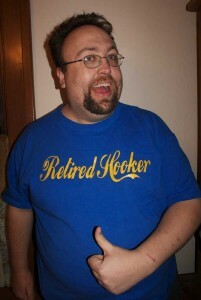 Laird Ryan: Harry Parker would think I was a fat jerk with a big mouth. That said, Harry is a kind person in a really deep down way, no matter how hard he tries to get past it. Me, I like Harry, but he’s dangerous to spend time with. Unlike him, I am entirely mortal. I’d be happy to chat with him time to time, but I’d avoid getting too close. The ASP: Do you consider Silver Bullets to be modern pulp fiction? What interests you about the pulp era? Laird Ryan: The pulp era appeals to me because it was a time when, if you were fast, and if you could hold a reader, you could pretty much make a guaranteed living writing. There was a market with millions of readers and it was a huge section of popular entertainment. Those days are past. The fiction of the era is filled with wild vivid characters, improbable stories and huge doses of fun. Also, sadly formulaic stuff, and the endemic racism and exoticism of the period. I’d like to use the good stuff, and leave as much of the bad stuff behind as I can. I want to play with the tropes and conventions of the form but not slavishly ape them. I love the kind of writing that is done in a hurry, where it’s so direct and intense, and naked. And yeah, it can be rough, too. They didn’t revise much then, and I do. I find, though, that Silver Bullets was a much stronger book for the time limit I wrote it under. It moves fast. Also, the internet makes serialized publication feasible in a way magazines aren’t anymore. You can do modern pulp cheap and fast and easy to distribute. So I thought, what the heck, I’d try it. I’m also working on my other stuff along the way, but I’m going to do at least 2 of these modern pulps a year. They keep my teeth sharp. The Asp is pleased to announce our first official release, Silver Bullets by Laird Ryan States. It is available for purchase as an e-book through Amazon, and its international affiliates, and we will be officially announcing print on demand paperback sales within the next couple of weeks. 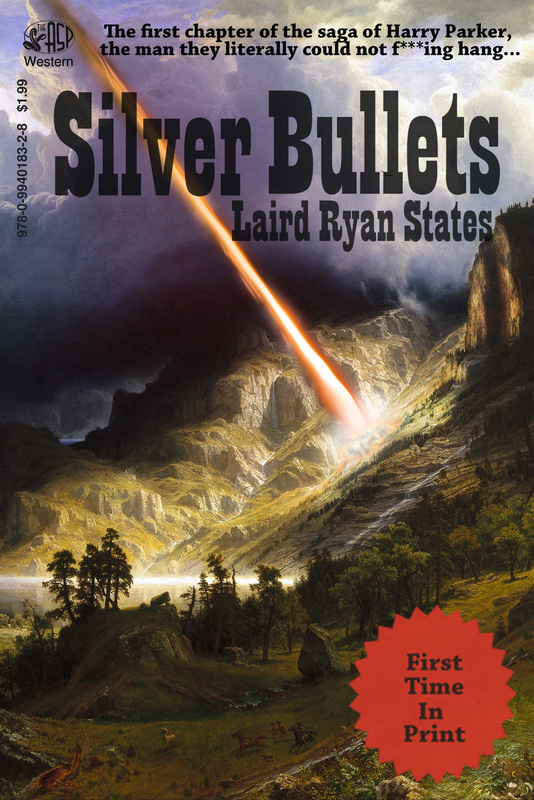 Silver Bullets is a weird western, with crossover elements and allusions to other literary works. It is the first in a planned series of New-Pulp novellas. If you can suggest any reviewers that we should send review copies to, let us know. If you have any questions, feel free to ask. We expect to post an interview with the Laird in the near future to discuss the book, and the future of the series.